The Boston Globe has some nice things to say about our upcoming EP and record release show. Chris Oquist and Keith Freund, the guitar/vocals and drums half of local four-piece RIBS, are coming from somewhere a bit more researched than the average new band. On a recent night out over drinks in Allston, Freund thinks back on an industry conference panelist’s idea of top-down bands versus bottom-up bands. Freund stops to ponder the utility of both models, but Oquist doesn’t need much time to decide. “I’m pretty sure I’d rather be Destiny’s Child than Bone Crusher,” he says with a shrug. RIBS, a band with a music business sense incubated at Berklee, has deployed its searingly loud music in small doses so far — a single here and there, basically, since 2010 — and Freund sees each song playing off different sides of that dynamic. He notes that songs like last winter’s “Please Don’t Go” worked like regular publicity angles and garnered great local press, while others like “Queen of Hearts” have taken on viral lives of their own on fan-created YouTube videos and Reddit. It’s a solid analytical approach that they’ve adopted toward their work; but time as a band has also taught them the benefits of loosening up and simply rocking out. Freund woke up at 2 p.m. on this day, caught in the middle of a mix-down binge of “Russian Blood,” the EP they’re set to release with a show at T.T. the Bear’s on May 25. It’s an epic mix of high octane stuff — post-rock/metal scorchers poured into vaguely pop molds with Billy Corgan levels of immodesty. The band puts on a serious light show onstage — over 55 cables need connecting before every set — and this music was built for it. RIBS is Freund’s first band, assembled during his last semester in school through band-wanted ads that name-checked stylistic touchstones like Muse and Smashing Pumpkins. He ended up with childhood friend Blake Fusilier, a second guitarist in shredding prodigy Justin Tolan (featured in Guitar Player magazine at age 18), and Oquist, who had been drumming in a black metal band. Oquist came from the school’s music business department and went about things from that mind-set in the beginning — working out a pro-looking Web presence, booking tours, fiddling with schedules for YouTube teasers. Still, a few years on the circuit helped reveal some new truths. Oquist found himself at Boston’s trend-setting Rethink Music conference last week and started to notice the unfortunate focus of lots of upcoming bands. “Everyone is looking for a silver bullet,” he said. “What can Foursquare do for me? What does Instragram do? Can I be a Pinterest band?” It all seemed pointless, he decided, if everyone stopped paying attention to their own music. But RIBS comes off like a new-fangled hybrid — taking advantage of a well-resourced background and launching a perfectly haywire creative adventure from there. “Russian Blood” is thoroughly DIY — mixed at Freund’s apartment, recorded in their practice space — but it carries itself like a really big deal. There are cement-grinding atmospherics out of Trent Reznor’s playbook and canyon banshee wails echoed from long-lost U2 anthems. It’s full of the visceral joys of music — the growl in the bass, the gleefully dissonant guitars; concerns that seem far removed from counting online friends and Twitter followers. There are epileptic moments that threaten to rattle apart at every bolted-down connection, bringing to mind ’90s electro-noisers like Braniac. The song designated as the lead single, “Kiss,” is a totally unruly pummeling from off-centered, fuzzed-out bass, and gut-check drums. Freund says he’s learned to let go a little bit — after two years and a couple mini-tours and even a concussion suffered during one show’s overexcited guitar swapping. But he’s still a fiend for lists — he can pull them up on his iPhone in seconds: lists for three days before the show (make sure the club has a tech rider), lists for a day before the show (make sure Oquist has drum mallets), lists for sound check (put phone in airplane mode). He has lists for lists, and he isn’t giving them up soon. RIBS have never shied away from their comparisons. Likened by fans and critics to such hard line, atmospheric rock monsters as Nine Inch Nails, Deftones and Muse, the Boston quartet embraces these associations as both a testament to their established musicality and an indicator of form towards attracting new fans. And after earning Reddit.com’s top–voted music post of all time within a month of releasing 2010 EP British Brains, (amongst other accolades) it’s clear that RIBS is a band that can flourish beyond the similarities. Oquist appealed to Freund and Fusilier in much the same way, telling them right off the bat that his favorite artists were Paul Simon and The Beatles. With influences ranging from metal to electronic to ‘60s pop and four incredibly talented musicians on board, RIBS had its final lineup by March 2009. The band set to work on their first EP, British Brains, a guitar-driven effort in industrial doom and gloom mixed and produced entirely by Freund. A year later, Freund posted the completed British Brains on Reddit.com, where its ratings skyrocketed and sold 600 copies in the first week. For their next record, RIBS tapered their mechanical appeal in place of a more dance-worthy post-punk on 2011’s Locrian Singles. RIBS have now cracked the local rock scene, garnering praise across Boston for their complex songwriting and fiery live performances. They’re currently working on releasing their next EP, Russian Blood, expected later this year. In the meantime, it’s all about performing in new and innovative ways. Incorporating vibrant lighting displays with their music, RIBS have set a standard of performance for Boston acts, and they promise something special—though they’re keeping quiet—for their east coast tour kickoff before snaking their way south towards Atlanta. And they’re hoping to pick up some new fans along the way. This is our first interview with Atlanta press (where three of us are originally from). Moe Castro of latestdisgrace.com talks with us about growing up in the South and making the move to Boston. Formed by Atlanta transplants Keith Freund and Blake Fusilier, RIBS is fast becoming one of Boston’s most popular and acclaimed bands. 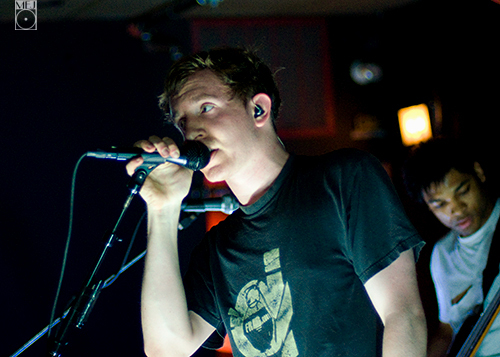 The group’s 2010 debut EP, British Brains, was lauded by both fans and critics alike for its dynamic blend of hard-edged aggression and moody atmospheric rock, an expansive sonic template that has earned the band comparisons to both forward-thinking alt rockers Queens of the Stone Age and Deftones, as well as gloom merchants Joy Division and the Cure. But long before the group could take the Hub by storm, Freund and Fusilier first had to make their way out of the ATL. Growing up in Dunwoody, in the shadow of downtown Atlanta, the two longtime friends spent most of high school writing songs together and dreaming of the day they might escape their hometown. This was the early 2000s and Dunwoody offered few opportunities for an underage rock band. As a result, most of their music never saw the light of the day and the two rarely performed live. Even going to see shows was difficult.